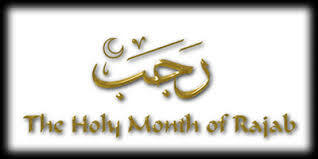 Rajab: The Month of Allah! “Rajab is the month of Allah, Sha’ban is my month, and Ramadan is the month of my Ummah (Nation).” The mere fact that it is the month of Allah means that it is made worthy of exalting. Salman Al Farsi, (one of the esteemed companions of our Prophet (pbuh) narrated that the Final Messenger of Allah (pbuh) had said that there is a day in the month of Rajab on which if a person fasts and performs ‘qiyam ul layl’ (night vigil), he will receive rewards like a person who fasted for a 100 years. This night is the 27th night and day of Rajab. This is the day when the Messenger of Allah (pbuh), traveled to Jerusalem and then ascended to the highest Heavens until he was in the presence of Allah SWT. In essence, the importance of Rajab is for anticipation and the preparation of the Holy month of Ramadan. It is also known as the month of istighfar (repentance). The best way of preparing the heart to receive divine gifts is its purification and repentance. Rajab is the month of planting seeds of worship, in Sha’ban you irrigate it with spiritual devotion and Ramadan should be your harvest. O Allah! Make the months of Rajab and Sha’ban blessed for us, and let us reach the month of Ramadan (prolong our life up to Ramadan), so that we may benefit from its merits and blessings. Ameen! This entry was posted in Uncategorized and tagged 27th of Rajab, 27th Rajab, Allah, Allah swt, Isra wal miraj, istighfar, merits of isra wal miraj, Merits of Rajab, night of ascension, one of the four sacred months, preparing for Ramadan, Purification of the heart in preparation of Ramadan, Rajab, Rajab tonight 2014, Rasul Allah saaw, repentance, The month of Allah. Bookmark the permalink.